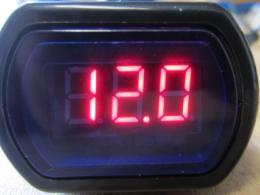 Pictured above is a car battery voltage meter which is designed to be inserted into the cigarette lighter socket of a vehicle to test and display the battery voltage – purchased for £1.76 including delivery from Hong Kong. It is relatively well made if a bit plasticky, but certainly as good as should be expected for a device at this sort of price. 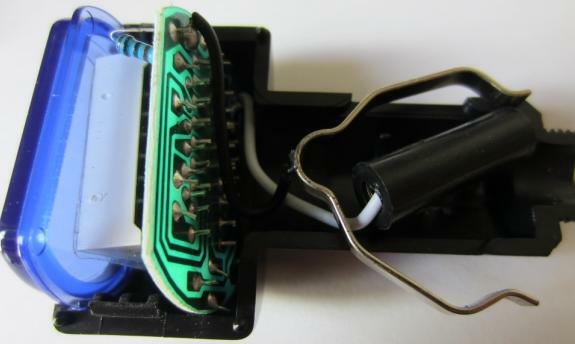 Inserting it into the car cigarette lighter socket it displayed the battery voltage accurately to well within 0.1V, and when tested with a variable power supply gave similarly reliable readings with an input voltage from 6V to 16V. The LED numerical display is bright – if anything too bright as the voltmeter draws 40mA when it is on which is too high to leave connected to a battery all the time (taking 1Ah of charge from the battery per day). We purchased this to test and to take apart for a project. Breaking it open was very easy. The plastic end cap is threaded onto the positive end of the cigarette lighter plug, and can be unscrewed (with a bit of force). Inside is a 5A fuse which should really be a 100mA fuse to properly protect the device. Then the two sections of black plastic can then be prised apart to expose the innards. There is a small circuit board with an IC on it, the LED display, a large resistor, some other common components, and a TL431 adjustable precision zener shunt regulator which is used as the voltage reference. We wanted this to stick on top of a solar charged 12V lead acid battery to display the battery voltage so we chopped off all the unnecessary bits and pieces leaving just the two wires for connection to the + and – terminals of the battery. The blue plastic cover is pretty much vital as without it it is very difficult to read the voltage from the display. Finally, to reduce power consumption, we wired a small push to make button to the white positive input cable and connected that and the black negative cable to the terminals of the battery. Now, whenever the button is pressed and held, the battery voltage is displayed. This mini LED battery voltmeter is only 3.5 x 2.5 x 1.0 centimetres in size and does the job perfectly. 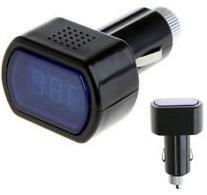 If you are interested in buying one of these car cigarette lighter LED voltmeters click here.